JOHANNESBURG — With coach Cody Proctor in his third season, the goal is now quite clear for the Johannesburg-Lewiston baseball team. “There is no reason why we can’t compete for a league title,” he said. “Obviously, there’s one team that has been at the top of our league the last couple years. So that’s who we need to beat, to knock them off the top. That team atop the Ski Valley has been rival St. Mary, which entered the season ranked No. 1 in Division 4. The Snowbirds have gone to three-straight state final fours. “It’s not going to be easy because, in baseball, we can’t be just a one-sided team,” Proctor continued. “Our pitching needs to be good, our defense needs to be good and we need to score runs. We need as few errors as possible. The Cardinals are also eying a district title, one Proctor thinks is achievable with the draw they have. They’re in a district with Atlanta, Hillman, Posen and Rogers City. Expected to lead the Cardinals to those titles is senior Tanner Shimel, who was J-L’s lone Herald Times All-Area first team player a year ago. He was also All-SVC first team, all-district and voted his team’s MVP. He helped with 27 runs scored and a .348 batting average while striking out 60 on the mound. Shimel will be the team’s ace this spring. He struck out 10 in his debut last weekend, so he’s well on his way to being a top player in Otsego County again. 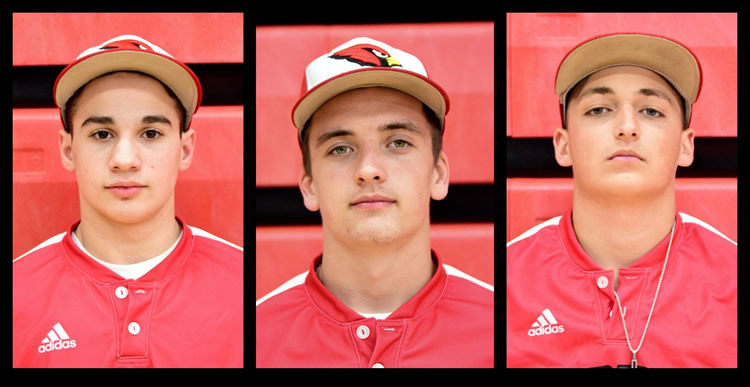 While the Cardinals graduated Jett Ewing, it does return a host of All-Area honorable mentions in Matt Ross, Tommy Runyan, Dan Runyan and Sheldon Huff. Proctor expects the pitching rotation to include Shimel, Huff, Lucas Newell, Tommy Runyan, Mason Myers, Ross and Preston Marlatt. The infielders include Dan Runyan at catcher, Tommy Runyan at first base, Tyler Madej at second, Shimel and Newell at shortstop and Huff at third. The starting outfielders are Austin Carroll in left, Marlatt in center and Kevin Gehringer in right. Ross, Trent Waltiere, Allen Morgan and Christian Pryor will also rotate in. ELSIE – Tyler Madej drew a walk to push in the winning run, as the Johannesburg-Lewiston baseball team topped Eben Junction Superior Central 11-1 in a neutral-site game Saturday at Ovid-Elsie. Lucas Newell doubled to bring home Preston Marlatt and Dan Runyan to cap off a six-run fifth inning that brought on the mercy rule. Newell was 2-of-3 batting with two doubles, while Austin Carroll also drove in a pair of runs. Superior Central walked seven J-L batters. Pitcher Sheldon Huff struck out three and walked three. "Sheldon pitched very well today, and our defense helped him," coach Cody Proctor said. "We turned two double plays in that game." The Cardinals (1-1) dropped the nightcap 3-0 to the host Marauders, despite Tanner Shimel pitching lights out. The senior threw 10 strikeouts, walked two and gave up only one earned run in four innings. Tommy Runyan and Lucas Newell closed the game. J-L, which visits Whittemore-Prescott for a doubleheader Thursday, April 11, mustered just two hits all game, both from Madej. "Offensively, we struggled all game," Proctor said. "We struck out nine times. What was really tough was Ovid-Elsie using a new pitcher every single inning. It was really hard to get into any kind of a rhythm with lefties, righties, new pitchers and different speeds. "We just couldn't string anything together. We had the bases loaded with one out. We had our opportunities and just couldn't capitalize."